Taiwan is an emerging market with a services-oriented economy, advanced industry, and stable financial system. The economy is healthy with low inflation, low unemployment, and trade surplus. Taiwanese equities are underperforming due to multiple contraction, not loss of earnings. Political Risk: DPP is expected to take power from KMT in upcoming January elections. Core Industry Risk: Investors perceive Taiwanese tech industry as obsolete. Infrastructure Risk: Power shortage is a headwind for industry. Macro Risk: Chinese economic slow down, rising US dollar, and Fed rate hikes scare investors from EM equities. Political risk is overstated: DPP will not reverse Taiwan’s economic ties with China; DPP-advocated new trade agreements can reaccelerate a slowing IT industry and foreign investment; DPP has a grand plan to diversify Taiwanese industry; government is on track for healthy financials. Core industry risk is overgeneralization: Taiwanese tech industry is alive and well. Infrastructure risk can be mitigated: Low commodity prices and new foreign investment agreements may mitigate this risk. Macro risk is potential opportunity: Taiwan compares well against other EM equity markets and may be a haven for asset reallocation. Overcoming risks may result in multiple expansion and convex returns. Taiwan is an island with 23 million people and the fifth largest economy in Asia. In 2014, Taiwan was the 19th largest economy in the world by PPP-adjusted GDP and 18th in PPP-adjusted GDP per capita according to the World Bank. Its nominal GDP (2014) was $505.45 billion (26th), which is export heavy at $318 billion. The island has an advanced economy composed 69% in services, 29% in industry, and 2% in agriculture. Major exports are electronics (computers, televisions, telecommunications), ships, petrochemicals, machinery, and textiles. Currently, Taiwan’s technology-focused economy is relatively healthy compared to other emerging market economies, which rely on commodity exports to a slowing Chinese economy. Real GDP growth was 3.7% in 2014 and is forecast to be 1.4% and 2.4% in 2015 and 2016 respectively. Unemployment is low: reported at 3.8% in September for a labor force estimated at 11.6 million people. Inflation is low: CPI was 1.2% in 2014 and forecast to be -0.4% in 2015 and 1.2% in 2016. Taiwan recently reported a $14.7 billion current account surplus and has the fifth largest foreign reserves in the world at $425 billion. The sovereign credit ratings are AA- by S&P, Aa3 by Moody’s, and A+ by Fitch. Taiwan has an active publicly-traded equity market. The strength of the equity market can be approximated through the MSCI Taiwan Index, which has futures and options that trade on the Singapore Exchange and an ETF that is traded on NYSE. MSCI Taiwan is comprised of 96 companies with a heavy weight towards the computer, semiconductor, and electronics industries. Taiwan Semiconductor (TSMC) makes up nearly 25% of the index. MSCI Taiwan has severely underperformed the S&P 500 and Shanghai Composite over the last 5 years. The below 5-year chart is adjusted to US dollars: S&P 500 (blue line) returned 66.1%, Shanghai Composite (green line) returned 33.5%, and MSCI Taiwan lost 12.3%. Internally, the Taiwanese equities market appears weak. Only 20 of the 96 companies in MSCI Taiwan are trading in the top 50% of their 52-week trading range. Only 5 of these companies belong to Taiwan’s core industry of technology (Core Industry Risk). Stocks that are performing well are in apparel, chemicals, financial services, packaged foods, and real estate industries. The bottom performing stocks in the index include 3 maritime shipping companies (Macro Risk), cement manufacturers (Macro Risk), a number of PC and LCD monitor manufacturers (Core Industry Risk), and surprisingly, Taiwan’s two airlines (Macro Risk), which should be benefiting from low jet fuel prices, but are likely pricing in fears of decreased Chinese tourism due to a slowing Chinese economy. Actual earnings data shows that Taiwanese businesses are not underperforming American and Chinese corporations as much as Exhibit 1 indicates. Exhibit 2 illustrates MSCI Taiwan (white line), S&P 500 (blue line), and Shanghai Composite (green line) earnings over the past five years. The histograms below the line chart show the rate of change in corporate earnings. Exhibit 3 illustrates that MSCI Taiwan is actually underperforming due to a contracting PE multiple. The index traded at a 24 PE multiple in 2012 but the multiple has contracted to a mere 12.2 today. Historically, MSCI Taiwan has traded at an average multiple of 17.7. Regaining even a 16 PE ratio would result in MSCI Taiwan increasing from today’s 309 to 405, a 31% upside. MSCI Taiwan is cheaper than equity indices of many other countries, such as the S&P 500 at 18.1 and the Shanghai Composite at 19.0. Over the past five years, the S&P 500 has enjoyed consistent multiple expansion and the Shanghai Composite recently had a multiple spike in mid-2015 as stock trading became popular in China. Why is the PE multiple of MSCI Taiwan contracting? Why are investors not willing to pay as much for a dollar of earnings in Taiwan than they are in other countries? The government of Taiwan formed when the Kuomintang (KMT) government of the Republic of China (ROC) relocated to the island after losing the Chinese Civil War to the Communist Party of China in 1949. Taiwan is recognized as a sovereign state called the “Republic of China” by 21 nations but considered a “rebellious province” by the People’s Republic of China (PRC). This condition has been a continuous headwind for the island state with implications on its standing in global politics and trade. KMT ruled the island as a single-party state until 1986 when the Democratic Progressive Party (DPP) was founded. In recent years, KMT has favored closer relations with PRC. Some in the party favor reunification in the long-term. In contrast, DPP distrusts PRC, promotes independence, and favors strengthening relations with other countries to the ire of PRC. Some in the DPP argue no declaration of independence is necessary because they believe Taiwan is already an independent sovereign nation. Under President Ma Ying-jeou of KMT, ROC and PRC signed 23 agreements, including the Economic Cooperation Framework Agreement (ECFA) and the recent and controversial Cross-Strait Service Trade Agreement (CSSTA). Cross-strait relations significantly improved under the Ma Administration. On November 7, 2015, ROC President Ma met PRC President Xi Jinping in Singapore. This marked the first time leaders of the two sides met since Chiang Kai Shek and Mao Zedong met in 1945. The DPP criticized the historic event as an attempt by the PRC to prop up the KMT, PRC’s preferred party, prior to the upcoming elections. On January 16, 2016, general elections will be held for the 14th President of ROC and the 9th Legislative Yuan. President Ma will be retiring after his maximum two terms and DPP candidate Tsai Ing-wen is widely expected to win the Presidential election by a landslide. Tsai Ing-wen would be Taiwan’s first female president. Polling by Taiwan Brain Trust on November 13-14 indicated 48.4% of respondents support Tsai, 20.4% support Chu (KMT), and 9.3% support Soong (People First Party). Prospects for the KMT are particularly dim as the party changed its candidate in October from the pro-Beijing Hung Hsiu-chu to New Taipei City Mayor Eric Chu. Hung advocated reunification with PRC, an unpopular position, and polled at only 13% prior to her replacement. In Taiwan, the president does not have veto power over legislation and so the Legislative Yuan does not require the president’s approval to pass laws. The president’s powers center on commander-in-chief of the military and head of state for conducting foreign policy, including negotiating treaties, declaration of war, and making of peace. The president appoints the premier who heads the Executive Yuan that administrates the government. The president also appoints the Council of Grand Justices that head the Judicial Yuan. Much attention is focused on the presidential election due to foreign policy implications, but the Legislative Yuan elections are equally important for domestic policymaking. KMT is expected to lose control of the Legislative Yuan after DPP won broadly in local elections last November. However, it is not certain if DPP will win an outright majority of seats. Its Pan-Green Coalition may control the Legislative Yuan if friendly party Taiwan Solidarity Union can win seats as well. Controlling both the Presidency and the Legislative Yuan would enable DPP to push its domestic and foreign policy agenda, which may be a game changer for investors. China: This issue is the largest uncertainty for investors and geopolitics analysts. There are misconceptions of what a DPP takeover will entail because former President Cheng Shui-bian (DPP) was a disaster for cross-strait relations. Tsai does not promote a declaration of independence or breaking away from economic activity with China that was developed during the Ma era. She promises there will be no scaling down on the Chinese tourist policies enacted by Ma. In general, Tsai has stated her cross-strait platform is to maintain the “status quo” and not undo the “accumulated outcomes” of the Ma administration. Tsai does not want to end warming relations with China; rather, she does not want Taiwan to be focused only on China. If this is true, much of the risk priced into Taiwanese equities is unfounded. Trade / International Relations: DPP favors joining the Trans-Pacific Partnership (TPP) and trade deals in general so that Taiwan has less economic reliance on China. Tsai encourages businesses to invest in Southeast Asia, rather than focus solely on mainland China for their supply chain and downstream business. Tsai proposes a “New Southward Policy” to build partnerships with Association of Southeast Asian Nations (ASEAN) and India. Key to this is cultural and educational research because President Lee’s “Go South” policy of 1993 failed as Taiwanese businesses encountered challenges with Southeast Asia related to different languages, cultures, and religions. See Trade Policy section below for more detail. Energy: DPP promotes an environmentalist agenda and is strongly against nuclear power, which the island relies on for 14% of its electricity given its lack of natural resources. Tsai proposes a green energy park in the Shalun area of Tainan to serve as a home for clean energy companies. Tsai is a proponent of hydrogen power and advocates a nuclear-free Taiwan by 2025. Monopoly utility Taiwan Power Company (“Taipower”) is a state-owned enterprise. There are currently no power-related companies in MSCI Taiwan, but the issue of power is a crucial one for the Taiwanese economy. See Infrastructure Risk section below for more detail. Technology: There is a perception that Taiwan’s core industry of technology is languishing due to reliance on mid-2000s trends. Tsai proposes growing in the area of information technology and communications. Specific areas include cybersecurity but also industrial applications in agriculture and marine. Technology comprises the bulk of MSCI Taiwan. See Core Industry Risk section below for more detail. Defense: Tsai argues for greater investment in Taiwan’s defense, including construction of new naval ships, including submarines, at domestic shipyards in Kaohsiung. CSBC Corp is a publicly traded ship maker that could receive new defense contracts, but it is not in MSCI Taiwan. Defense is an insignificant portion of Taiwan’s GDP. There are currently no defense contractors in MSCI Taiwan so any increase in defense spending would be very long-term or indirect in its effect on MSCI Taiwan. Biotech: Tsai envisions Taiwan becoming a biomedical research and development center in the Asia Pacific region. She argues that Taiwan has world class medical personnel and facilities to conduct research on and clinical tests of new drugs and medical equipment. Furthermore, the costs of medical R&D in Taiwan is lower than in Japan, Singapore, and Australia. Taiwan has advantages over the West for treating East Asian specific medical conditions. Tsai points to Taiwan’s genetic database for East Asian ethnic groups and better understanding of East Asian lifestyle habits and environments. Tsai proposes cooperation with US, European, and Japanese companies on R&D while continuing to negotiate with China to open the mainland market to Taiwanese medical products. Currently, pharmaceuticals and biomedical devices are an insignificant portion of Taiwan’s GDP and no companies listed in MSCI Taiwan are pharmaceutical, biotech, or biomedical device companies. Government incentives to promote biotech would be very long-term or indirect in their effect on MSCI Taiwan. On November 16, 2015, the Legislative Yuan passed a revision to income tax laws that abolished a proposed capital gains tax. The Taiex index rose 1.5% that day. Longer-term, this may be an indication that Taiwanese lawmakers are amiable towards investors. The Taiwanese government’s “Sound Finance Program” has been successful at cutting the government budget deficit. The deficit has fallen from 2.4% of GDP in 2012 to 0.8% of GDP in 2014. The 2016 budget forecasts revenue growth of 3.8% and expenditure growth of 3.3%. Government debt fell to 44.7% of GDP in 2014. Moody’s and Fitch do not believe Tsai’s government policies would stray from these trends. Taiwan is a member of the Asian Development Bank (ADB), World Trade Organization (WTO), and Asia-Pacific Economic Cooperation (APEC). Taiwan currently has free trade agreements with PRC, El Salvador, Guatemala, Honduras, Nicaragua, New Zealand, Panama, and Singapore. KMT focused on establishing trade relations with PRC, which was critical for Taiwan’s growth, but this focus came at the cost of establishing similar relationships with other countries. KMT had been hesitant on pursuing other trade agreements in fear of angering Beijing. In contrast, DPP plans to enter trade agreements with new partners all over the globe to find new markets for Taiwan’s products. In September 2013, Taiwan announced interest to join the TPP. The KMT is pro-TPP as well, but Minister of Economic Affairs John Deng said that Taiwan would only be able to join the TPP if PRC does not oppose it. He fears PRC will pressure the TPP members to deny Taiwan’s entry into the partnership. Entry into the TPP requires unanimous approval by the 12 TPP members: Australia, Brunei, Canada, Chile, Japan, Malaysia, Mexico, New Zealand, Peru, Singapore, United States, and Vietnam. China has not announced interest to join the TPP. If Tsai is elected as expected, she plans to pursue Taiwan’s entry into the TPP. Admission to the TPP would enable Taiwan’s more commoditized products to compete better against those of foreign firms that already enjoy free trade agreements. The TPP contains provisions to facilitate production and supply chains in seamless trade. This is highly beneficial for the Taiwanese economy, which serves as a supply chain stop for technology products. The investor-state dispute settlement (ISDS) provision may entice investors to invest more in Taiwan. ISDS offers foreign investor protection for when governments “change the rules” on investors. A particularly important example is that foreign investors have been deterred to invest in power projects in Taiwan after the Fair Trade Commission sued independent power producers owned by foreign investors in an attempt to renegotiate power purchasing agreements to lower rates. 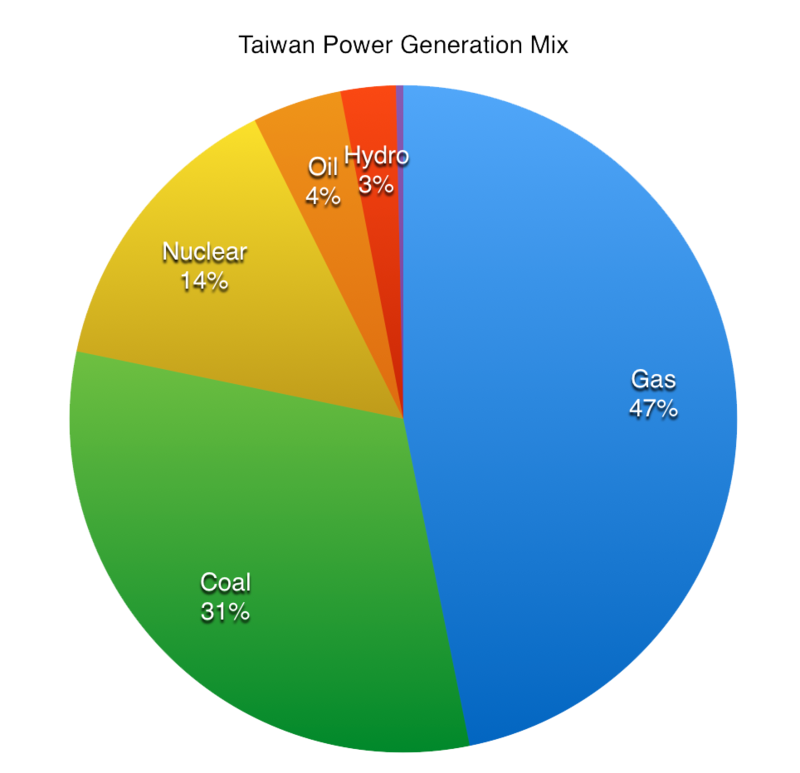 Investor disputes with the Taiwanese government have contributed to the electrical power problem discussed below. TPP will be beneficial for the earnings growth of Taiwanese exporters, especially MSCI Taiwan heavy-weights TSMC and Hon Hai. However, tangible benefits of the TPP are in the distant future as ratification by members will take years and Taiwan’s acceptance is not guaranteed. Taiwan is suffering a serious electrical power problem. In summer 2015, reserve margins fell below 5%—a margin of 15% is typically regarded as a minimum standard. The risk of a power shortage is a considerable operating risk for industry, especially for firms like TSMC in which a millisecond of power loss would render its semiconductors in production as unusable. The country could, in the future, suffer rolling blackouts and higher power costs. Industry consumes 53% of the electrical power on the island. The power problem may hinder economic growth as tech manufacturing must move overseas for adequate power supplies. Taiwan currently enjoys low electrical tariffs compared to other Asian countries and these tariffs will likely rise to finance new power production. This will reduce profitability for industry on the island. However, this is an ongoing problem that is likely priced into MSCI Taiwan already in the form of multiple contraction. The problem is rooted in continuously growing power demand from economic growth in face of a decrease in supply. Taipower had been transitioning its coal-generated electrical production to nuclear power. However, recent protests by anti-nuclear environmentalists have prevented the state-owned utility from turning on the new 2.7GW nuclear plant that was intended to replace the coal plants it has been shutting down. Furthermore, DPP vows to shutdown all of Taiwan’s six currently operating nuclear reactors by 2025, which are responsible for 5.1GW of production. Currently, Taipower produces electricity from nuclear plants at NT$960/MW-hr while electricity from its other sources cost NT$2470/MW-hr. Taipower is already struggling financially. The utility is heavily invested in the new 2.7GW nuclear plant and will have difficulty raising additional debt to fund new projects. It will also take years to construct new coal or gas plants to replace the lost capacity. Importing coal and natural gas to Taiwan is relatively expensive, but it is currently cheaper than it was over the past decade due to the downturn in global commodity markets. Taiwan’s laws allow 20% of power be supplied by independent power providers and these projects are often financed by foreign investors. However, recent disputes between the government and foreign investors have deterred new capital. International arbitration like that proposed in the TPP could ease foreign investors back into Taiwanese power generation. Taiwan lacks land and is too rainy for solar to be effective. Environmentalists oppose wind turbine placements. Tsai prefers hydrogen power but such technology is not yet available at utility scale. Given the choices, it is uncertain if the environmentalist DPP would prefer Taipower to pursue additional fossil fuel generated electricity to replace nuclear. It may be that given the choices of investing in coal/gas vs turning on the nuclear plant vs electrical power crisis, DPP chooses to turn on the new nuclear plant. Earnings growth of Taiwanese companies may be hindered by power shortages in the next few years. This is a politically created problem as the power capacity is available in the form of a newly constructed nuclear plant, but that solution is blocked by anti-nuclear factions in the government. The problem may be mitigated if more cheap natural gas from the US is available for import or DPP realizes abandoning nuclear is unrealistic when utility-scale hydrogen power is years or decades away. It may be a non-issue for firms like Hon Hai, which have manufacturing plants all over the world. Many investors may be bearish on Taiwan because nine of the worst stocks on Morgan Stanley’s Asia-Pacific Infotech Index are all from Taiwan. These firms were leaders in computer hardware but never adapted to the shift away from desktop and notebook computers. MSCI Taiwan is comprised of many firms like Acer, Asustek, AU Optronics, Epistar, Quanta Computer, and Synnex Technology that make PCs and LCD monitors or the components that go into them. Taiwanese companies that did capitalize on changing trends such as HTC (a once leading smartphone maker) and TPK (inventor of the touchscreen for Apple’s first iPhone) failed to keep ahead of the competition and their stocks have been punished severely. However, Taiwan’s tech sector is not completely stuck in the past. TSMC, which carries a 25% weight in MSCI Taiwan, continues to outperform as the contractor of choice to produce chips for the world’s fabless semiconductor designers including Apple, AMD, Broadcom, Marvell, nVidia, and Qualcomm. Hon Hai (Foxconn), which carries a 8.6% weight in the index, manufactures Apple’s iPhone and iPad, Sony’s PlayStation 4, Microsoft’s Xbox One, Amazon’s Kindle, Nintendo’s Wii U, and PCs for Apple, HP, and Dell. The global trend towards mobile and appliance electronics should continue and these two goliaths of tech manufacturing will benefit, especially if free trade agreements open doors to new customers or reduce cost of business with existing customers. Other tech firms that have adapted to new trends in technology include Mediatek, which carries a 2.8% weight in MSCI Tawain and makes the system-on-chip (SoC) that enables computer processing and LTE-network connectivity for smartphones and tablets including the Kindle. Mediatek’s growth potential is substantial as it is a distant second behind Qualcomm in market share, but its new Helios X20 chipset is rumored to be taking Qualcomm’s spot inside Xiaomi’s next-generation high-end smartphones. If these predictions are true, Mediatek’s chipsets may proliferate across Chinese-made phones as the smaller phone makers tend to follow Xiaomi’s lead. Powertech Technology, which is a top performer in the index and carries a 0.34% weight, manufactures the Apple S1 SoC for the Apple Watch. The trend towards “wearables” appears to only be beginning—this an example of another potentially strong earnings driver for MSCI Taiwan. The American tech sector is one of the bright spots in the global economy and it continually chooses TSMC and Hon Hai to manufacture its product designs. At 34% of MSCI Taiwan, these two firms more than makeup for the index components that lag due to legacy PC-reliance. Smaller Taiwanese firms have continued to innovate to play critical roles in new technology and can grow earnings for MSCI Taiwan for years to come. The economic slowdown in China is affecting MSCI Taiwan as expected. The equity of maritime shipping companies and cement manufacturers have sold off significantly. However, Exhibit 2 indicated that MSCI Taiwan earnings growth has been somewhat resilient while Shanghai Composite earnings growth has turned negative. Taiwanese corporations are not affected by a slowdown as much as one would expect. Although 40% of Taiwanese exports are to China, much of these exports are parts for assembly that are then exported elsewhere and therefore not dependent on China for final demand. Two-thirds of Taiwan’s exports to China are re-exported to US or Europe. There are 12 banks and investment banks in MSCI Taiwan and combined represent approximately 11% of the index. Fitch estimates that 8% of Taiwan’s banking assets are exposed to mainland China—this compares well to neighbors as 32% of Hong Kong’s banking assets, 21% of Macao’s banking assets, and 12% of Singapore’s banking assets are exposed to mainland China. Non-performing loan ratio was 0.25% at the end of Q1Y2015 and capital adequacy ratios were at 12.5% at the end of Q2Y2015, well above the 8.0% regulatory minimum. Moody’s describes Taiwanese banks as having a “solid financial base” due to “strong liquidity profiles, favorable asset quality, adequate capital adequacy, and improving profitability.” The credit rating firm’s weighted-average BCA for the top ten banks is baa2. It appears many investors realize this. Taiwanese equities faired relatively well in the August-September sell-off compared to those of neighboring countries. Global funds reportedly reduced holdings of securities in India, Indonesia, South Korea, and Thailand and increased holdings of equities in Taiwan in the wake of the China-related sell off. The same was true in 1997-1999, when Taiwan fared better than its neighbors in the Asian Financial Crisis. For asset allocators, Taiwan offers asset managers emerging market exposure that is not tied to falling commodity prices and exports of basic materials to China. The upcoming Fed rate hikes and strengthening US dollar have been detrimental to EM equities and currencies. 75% of firms listed on the Taiwan Stock Exchange have revenue denominated in US dollars so a strong dollar helps their earnings in New Taiwan Dollar (TWD) terms. Taiwan’s financial system is relatively stable compared to other Asian EM economies as its sovereign bonds are 99% domestically held, entirely denominated in TWD, and yields are the lowest in Asia ex-Japan, with the Taiwan 10-year at 1.16%. The implied volatility of the TWD currency is currently 6.78% while historic volatility is 9.19%. Investments in Taiwan should react well to a strengthening US dollar and rising US rates compared to other Asian EM investments that are more at risk of foreign investor outflows. The risks of Chinese economic slowdown, strong US dollar, and Fed rate hikes are global. Taiwanese equities should perform better then other EM markets against these headwinds and so these risk are actually reasons for asset managers to allocate capital to Taiwan. Taiwan has a strong foundation to enable equity appreciation with healthy government financials and macroeconomics. However, MSCI Taiwan is trading cheaply relative to other equity indices—the index has underperformed due to multiple contraction rather than slowing earnings. This is likely caused by uncertainty over a DPP takeover, the overhanging electrical power problem, a perception that Taiwanese tech industry has become obsolete, and concern over the Chinese economic slowdown. Investor concerns relating to DPP disrupting Chinese trade are overstated. The downside scenario that DPP reverse the agreements established with China during the Ma years is unlikely while the upside scenario that DPP expands Taiwan’s trade opportunities is more likely. Increased international cooperation may mitigate the electrical power problem and reinvigorate the tech industry. On going macro risks relating to China, Fed, and US dollar may actually be reasons asset managers reallocate to Taiwan from other EM equities. If these events play out favorably, Taiwanese equities may regain multiple expansion, which will result in significantly higher equity values. If MSCI Taiwan returns to its historical average PE of 17.7 (which is more in line with other equity indices), the index would be trading at 448.45 from the current 309.10 based on current earnings. This 46% return would translate into $19.61 for the iShares MSCI Taiwan ETF (EWT). The options on the iShares ETF may be preferable as the index has more liquid long-dated options than the Singapore Exchange listed futures contract. Buying the January ’17 14-strike call on EWT at 1.05 (23.0% IV) would amount to a 434% return if EWT settles at 19.61 at January ’17 expiration. The position would result in a 100% loss if EWT settles at 14 or below at expiration. However, the long-dated options trade with large bid-ask spreads and so it is uncertain that an investor can accumulate a large position of calls near the midpoint of the bid-ask.